Did you know that when you reserve your hotel stay on Miami Beach 411, you get a 15% coupon good for any of our tours in Miami and Key West? The coupon is valid for the Miami City Tour, Everglades Trip, and Boat Cusie, as well as all of our tours to Key West, including snorkeling! Make a Hotel Reservation Today! After the reservation is complete, we'll email you the coupon code. Rather make your hotel reservation over the phone? Call toll free in the US or Canada: 1-800-573-6351. The Telephone Hotline is open 24/7. 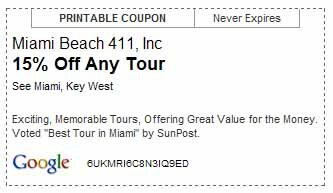 Miami Tour Coupon Special in Miami Beach 411.